It was a dark, blustery Halloween evening. Which meant it was time for our Witches Brew Benefit Variety Show! Advance tickets had sold out, meaning El Gabinete was full of revellers awaiting with trepidation a night of spooky entertainment from our eerie array of performers. 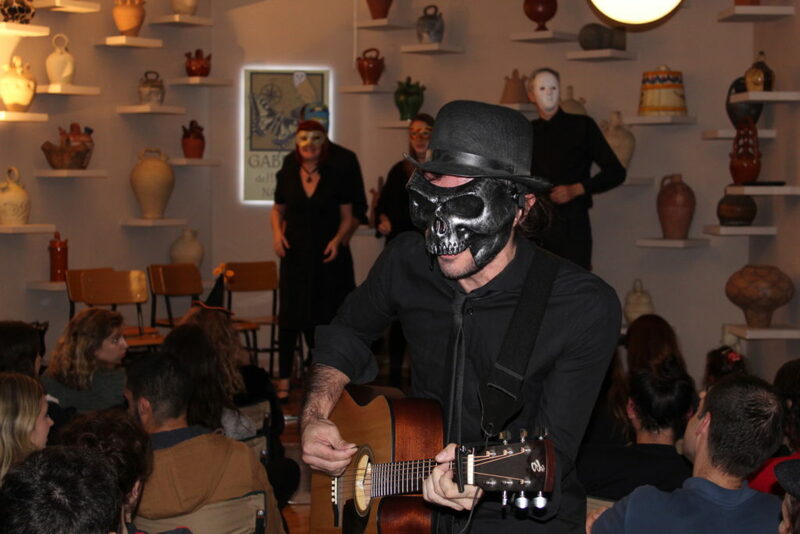 Hosted by the ghoulish Dominic Anglim, we enjoyed the scarily good talents of story teller and poet J.D Candora. Claire Jones provided us with a stand-up routine detailing the trials of modern dating and Tinder – a terrifying subject if I ever heard one. 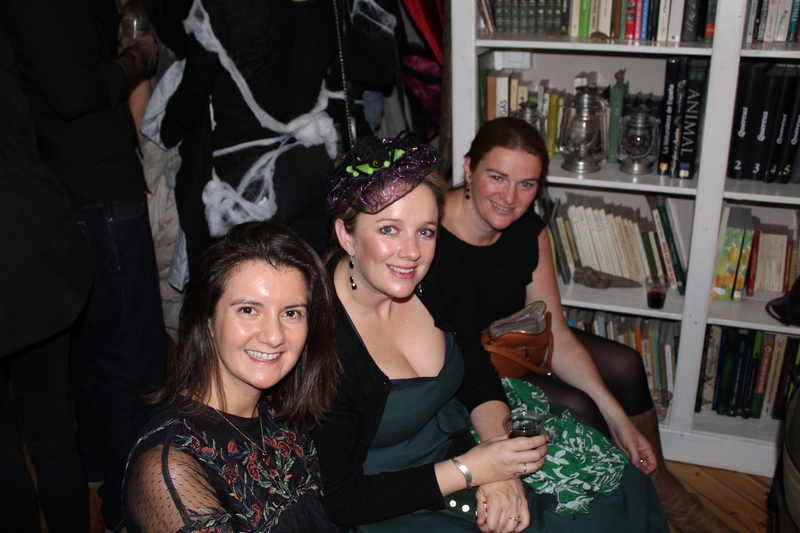 We also heard some Halloween themed songs from Pablo Kenwa Perez, and the hauntingly beautiful voice of Becca Johnson. 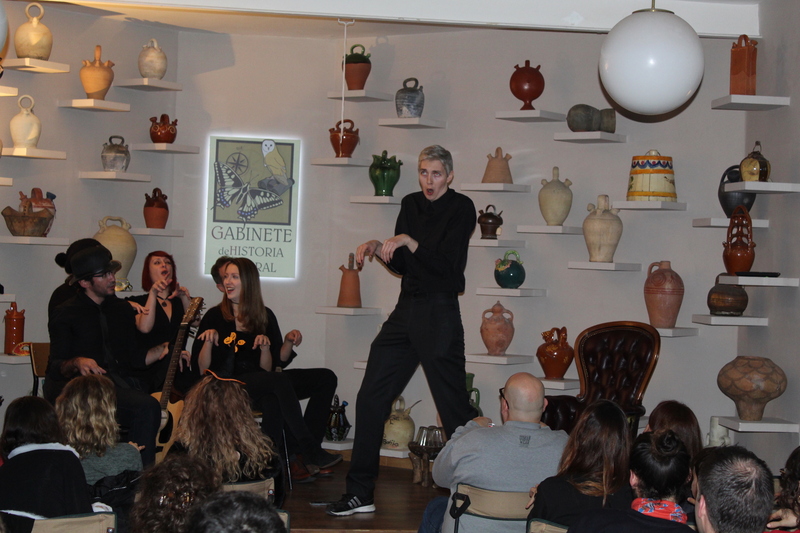 Not to forget improv comedy from Suzy-Bo Palfreyman, featuring our host Dominic and Claire as well – some scarily bad puns in both Spanish and English. Just as we began to despair that the night was coming to an end, Madame Señorita arrived and shook us up with her hilarious and creative improv act. After the show, guests stayed behind to have a few more drinks and sampled our delicious sweet and savoury tapas from our very own refugee chefs. 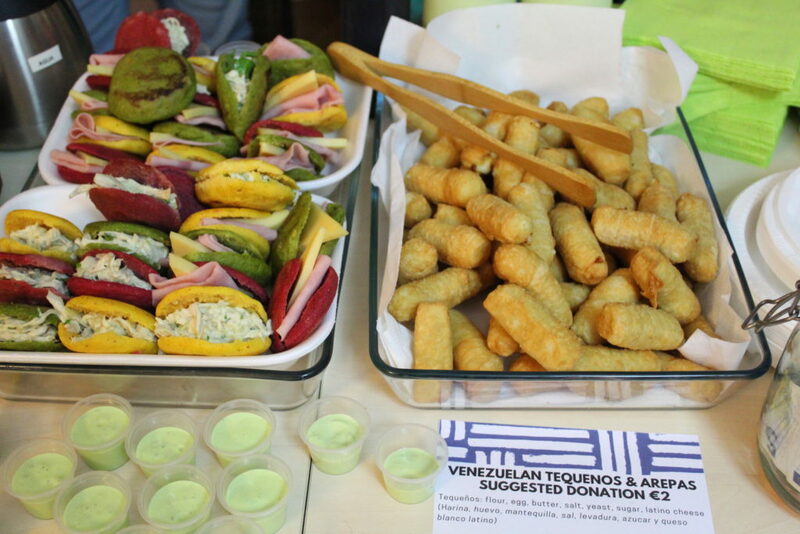 Valentin cooked us a taste of Venezuela with amazing arepas and tequenos, whilst Wesal and her family served up Arabic pastries and Baklava alongside Arabic coffee. To see more of her delicious food find her on facebook here. At the end of the night we revealed the winners of our raffle, which included the chance to win a free brunch at Roll Madrid and a six-pack of beers from La Quince brewery here in Madrid. There was also a place at our new Yoga and Meditation class up for grabs. Starting on Monday 5th of November, we will be holding this new 90 minute class in El Gabinete bi-weekly, all proceeds going straight back into continuing the work we do here at Madrid For Refugees. A big thank-you to our wonderful volunteers, Yasin, Marta, Rachel, Laura, Sarah, Andrea, Georgia, Ivan, Christina and Nichole, and of course all our amazing performers. But the most important thank you is to everyone who came along and enjoyed the night with us. The proceeds from the event tickets, drinks and raffle will all go back into funding Madrid For Refugees’ initiatives to support and integrate refugees in the city. As well as this, we are able to maintain our space in El Gabinete so we can continue putting on great events such as our clases de cocina solidaria, our Yoga classes and our coding classes for refugees. All donations for the food served went straight to the chefs themselves. In the next few months we have more of our amazing cooking classes hosted by our chefs, alongside our Yoga and Meditation every other Monday. Keep an eye on our events page to find out more.